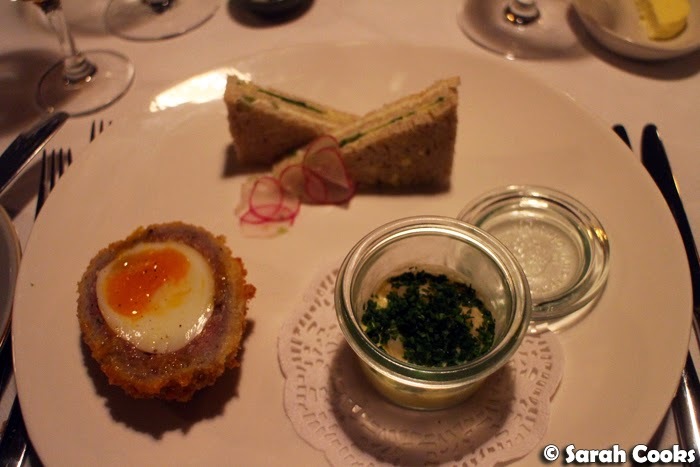 Sarah Cooks: Prix Fixe - "An English Midwinter"
So my friend Alaina and I went to Prix Fixe last night and had a ball! Normally there's a bit of a delay between me eating somewhere and my blogging about it - usually a couple of weeks, sometimes months! - but I thought I'd try writing this one up quickly, while y'all can still try the Narnia-inspired "English Midwinter" menu at Prix Fixe. (It's available until the end of August!) You can read my previous post on Prix Fixe's "Whole Hog" menu to read the lowdown on the ticketing system, the decor yada yada yada. Today, I just wanna talk about the food! Because we've visited before, I'm on the Prix Fixe mailing list, so I get email notifications when each month's new menu is announced. Dangerous! 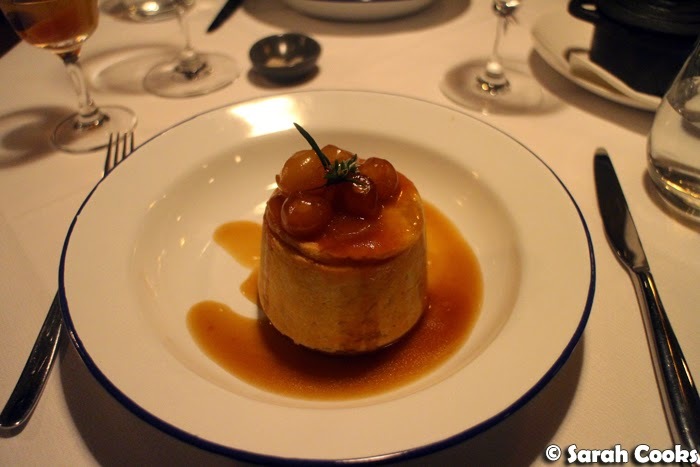 Lots of my foodie friends went gaga for July's "Vive la France" menu, and whilst it did look amazing, the "An English Midwinter" menu one really spoke to me. Scotch egg? Lamb suet pudding? Yes please! Y'all know I'm a big Anglophile and love stodgy traditional British food, thanks in no small part to my Sarah Discovers How to Eat project - steamed suet puddings, rich cheese, crumbles, roasts, Yorkshire puddings, pies, whatever. How fabulous. Few people I know share my enthusiasm for all things stodge, so I was thrilled when Alaina said she was keen and I hurriedly booked us a place. That's one of the positives of the pay-in-advance ticketing system - no backsies! Of course, the inflexibility is also a negative - on the evening of our dinner I happened to be really under the weather with a cold, but did not want to miss out, so I just took it easy that day, slapped on a lot of makeup and headed to the restaurant! (Truthfully, I'd have probably slapped on heaps of makeup anyway - I'm really into makeup right now). Given my condition, and the theme of the night, I was hoping there'd be some kind of hot cocktail on the menu that night - a hot whiskey toddy or something similar - and was really pleased to see a hot mulled cider for two. (Alaina graciously shared with me!) It had a beautiful, Christmassy aroma: brandy, candied fruit, honey and spices. 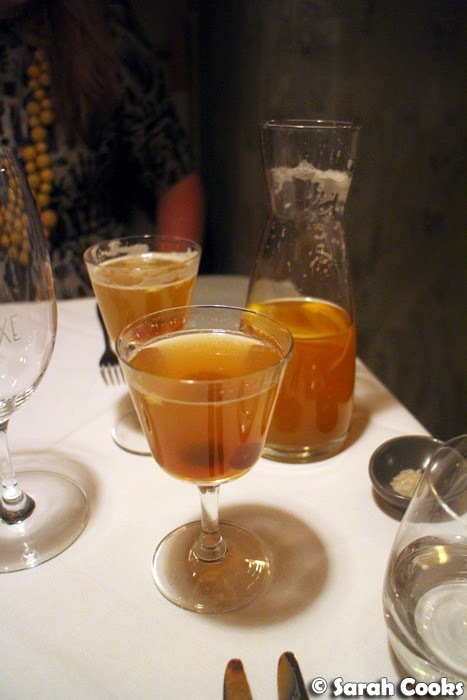 I'd tried a decidedly average mulled cider at the Madame Brussels Lane Christmas market the week before, and Prix Fixe's mulled cider was in a totally different league. 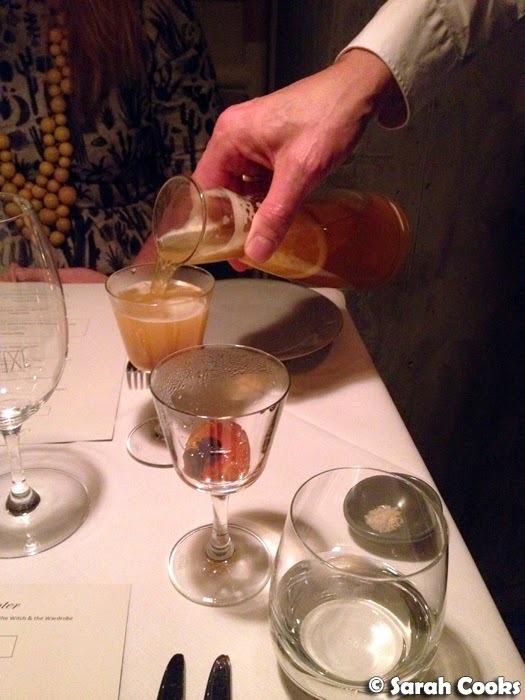 It was quite alcoholic, but all the flavours were restrained and blended together really well. (We chose a themed cocktail instead of the matching wines, and I think we made the right choice). Actually, before the night I was wondering if they'd have a Tilda Swinton-themed cocktail. They didn't, but in my mind, a Tilda Swinton cocktail would be made of extremely dry, expensive gin with a twist of ginger. Hehehe. Argh, Tilda is so awesome. 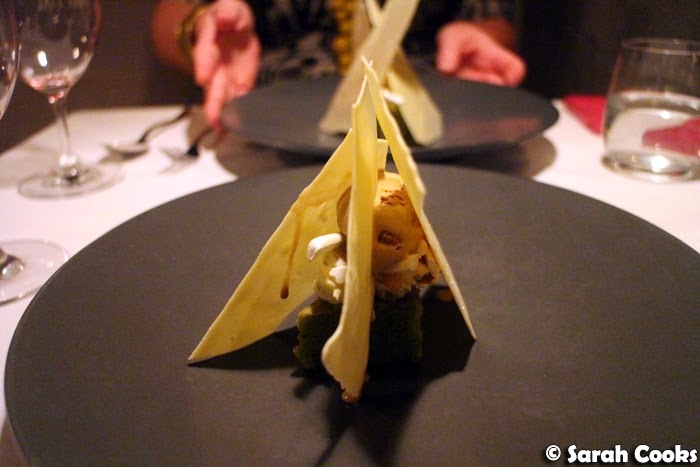 So it seems that the structure of the menu each month stays constant: a small soup, a plate of three or four small bites, a main and a dessert. Let's have a look. 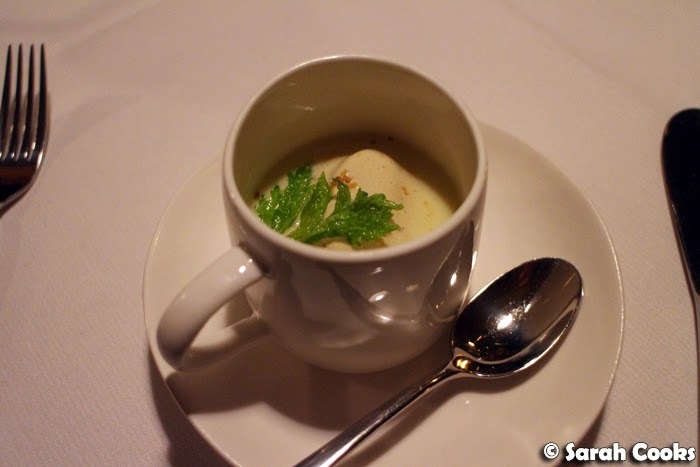 I am not the biggest fan of celery, but loved this soup! It was rich and creamy, and the scoop of Stilton ice-cream inside had a similar texture but contrasting temperature - lovely! There were also little pops of sweetness from candied walnut and (I believe) candied celery leaf. 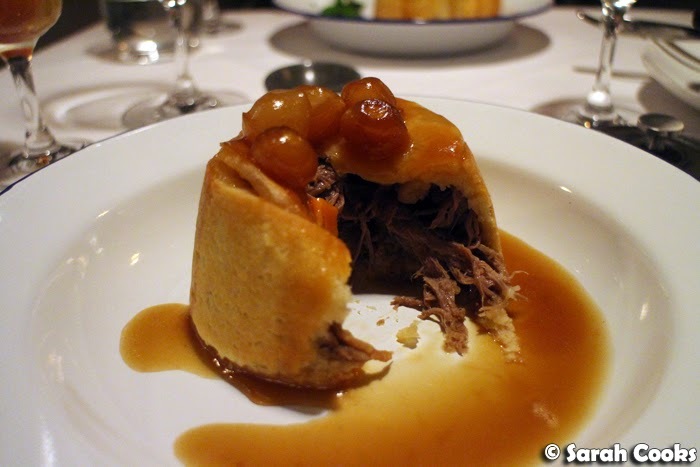 The main course, a lamb suet pudding, was brought out unsauced, with the intense jus poured over at the table. The pudding was chock full of tender slow-cooked lamb, and the pastry was both light yet rich. Overall it was very heartwarming, with the pickled onions cutting through the richness. How is it that lamb fat creates such light pastry? (I asked the waitress, and the pastry was made with lamb suet, rather than the more usual beef suet). Eating this gorgeous pudding makes me want to make something similar at home - the last time I made suet pastry was nine years ago, when I made a steak and kidney pie for my beloved Uncle Mike, who, sadly, is no longer with us. Miss you! 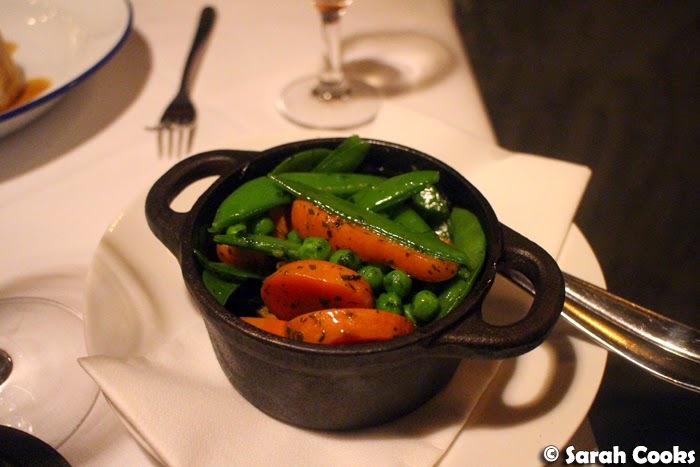 Onto happier topics - accompanying the pudding was a simple and delicious cocotte of peas, snowpeas and carrots. Halfway through the mains, we decided we felt like a glass of wine each, and just went with the suggested wine match: a 2011 Lefage 'Tesselae' Carignan, from Roussillon. It was a medium bodied, quite fruity wine. 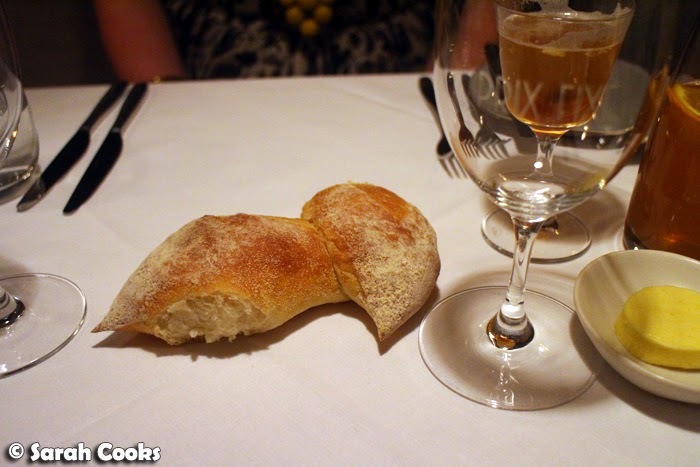 It matched well with the lamb suet pudding, and with the cheese course. The cheddar was slightly creamy (for a cheddar), but still nice and pungent. 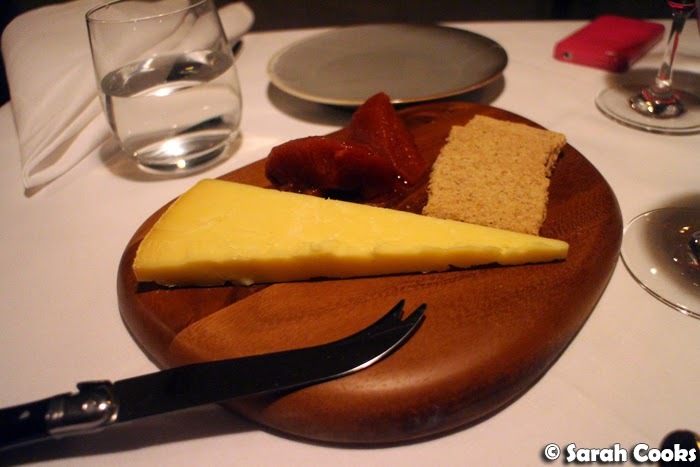 The crisp little oat cakes were the perfect accompaniment (different, but no less delicious, than the thick stodgy oatcakes I normally bake), and I loved the Sauternes poached quince. (N.B. the menu says "pickled" quince, but I believe the waiter said poached). Either way, the quince was super soft and gorgeous. We were both super impressed by the dessert! 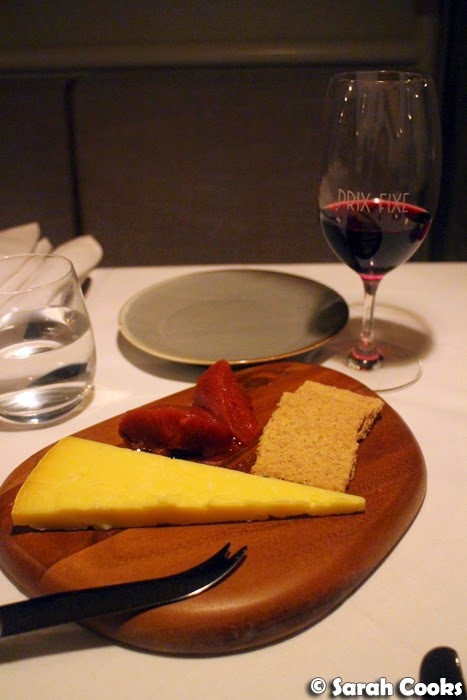 Neither of us really like Turkish delight so we were on the fence when we saw it on the menu before booking - but neither of us like liquorice, and we loved the liquorice allsort dessert the last time we were at Prix Fixe, so we were more than happy to give it a go. 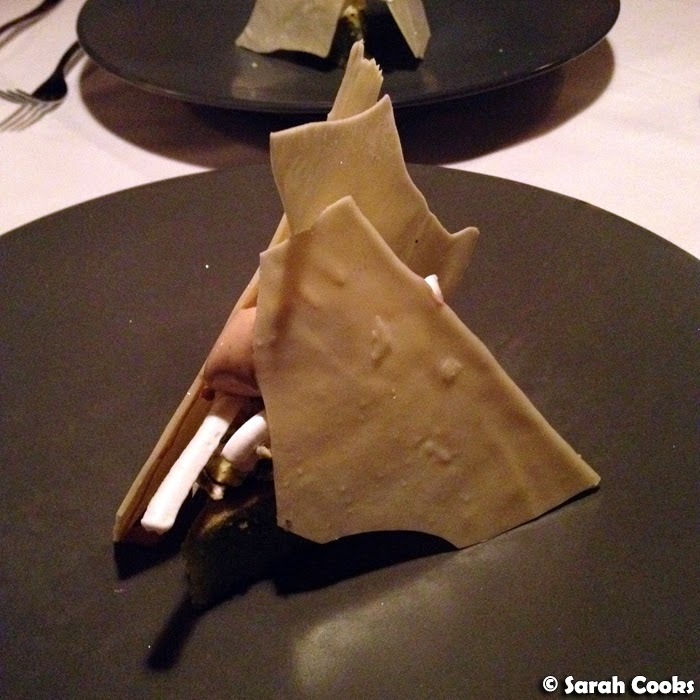 The description on the menu was simply: "Turkish delight, pistachio, white chocolate", but there was a lot more going on in this dessert! On the base was a diamond of pistachio frangipane cake, topped with pieces of nougat and rose Turkish delight, meringue wands and a scoop of espresso and cardamom ice-cream. This was all decorated with shards of tempered white chocolate, which was decorated with edible glitter. Alaina normally lives by the "Eat it, don't tweet it" motto, but even she had to take a photo of this one, angling the plate so she could get the green cake and glittery white chocolate shard in the same shot. I really enjoyed the dessert, and loved how the spiced espresso ice-cream brought all the sweet elements together. If I was being super nitpicky about the dessert, I'd say it was a little sweet for me, and the nougat was a touch on the chewy side (I didn't eat it all), but I loved it overall. Thanks to Alaina for coming with me! And congratulations to Chef Philippa Sibley for winning Chef of the Year at the Time Out Melbourne Food Awards! Such an incredible looking dinner. Always a good sign if you're keen to post about it straight away!